Penny Warner: Blog: Circle the Wagons - It's all you can eat! The main reason my husband and I like to travel is not so much to visit distant relatives, check out famous museums, or see the local sights. No, we go to eat. Wherever we are, we love to tour the regional restaurants and taste local delicacies, everything from Texas chow to Wisconsin cheese, from New York egg creams to Gilroy garlic ice cream. It’s all about the food. When we heard the Food Truck Phenom would be invading the Alameda Fairground in Pleasanton, we decided to check it out. Instead of spending all that money on gas traveling throughout the country for a taste of the nation—even the world—we figured we could find it all in one place (other than a shopping mall food court, that is). We sort of knew what to expect after watching “The Great Food Truck Race” reality show on TV, which always left us drooling: Invite friends so we could order a variety of foods and share bites. After arranging to meet Ann Parker, Colleen Casey, and Staci McLaughlin, along with Staci’s two kids, Jake and Connor, and we headed for the fairgrounds. We paid the eight dollar parking fee and three dollar entry fee, then found ourselves in a wonderland of mouth-watering aromas. Trucks that had once hauled mail, carried overnight packages, and even bussed school children were now painted bright colors, given festive names, and turned into mobile mini-kitchens. They’d circled up like wagon trains, surrounding the grassy picnic area to await hungry customers. It took us nearly thirty minutes to check out all twenty trucks and peruse the various tempting menus. We had to make some tough decisions. Should we sample Chairman Bao’s pork belly buns or go for the Lobster Shack’s lobster mac and cheese? We’d heard good things about Nom Nom’s Vietnamese tacos, but the Tikka Masala burrito beckoned from the next truck over. And what about Babaloo’s Cuban Ricky Ricardo sandwich? Or the Korean Fusion at Bulkalbi? Or the Asian soul food at Soulnese’s? Those were just the main course items. What would we do when it came time for dessert? 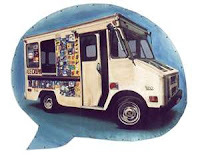 Would we head for Twisted Chill’s soft serve ice cream, Sunshine Susan’s Solar Ice Cream sundaes, Sweet Constructions chocolate crackle cookies or That’s Sweet whoopee pies? We split up, each heading for a different truck. Overwhelmed, I made my first stop at the wine vendor for a plastic cup of chardonnay to whet my palate—as if it needed whetting. The weather was perfect—unseasonably warm for October—and strolling past the crazy, colorful trucks, inhaling the fragrant odors of food cooking, was a slice of heaven. We met back at the picnic table to cut up and share our finds, while the kids played on the grass and listened to the live music. After sampling everything, I couldn’t remember what I ate or which truck it came from, but it was all good. I barely had enough room left in my stomach for a Zantac, let alone dessert. We resolved to come back again when the trucks returned to the fairgrounds. But next time I’m eating dessert first.